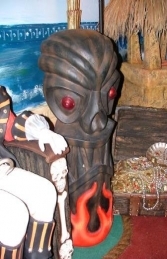 Fantastic 6ft tall Fire Tiki, suitable for any tropical, Caribbean or Pacific tribal style setting. Looks great with our surfer models for a Hawaiian vibe or to set off the Pirate models. 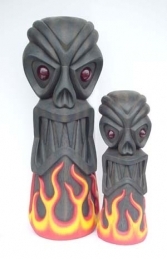 These great carved wood effect resin replica Fire Tiki models have glowing eyes and are surrounded with brightly painted flames to give an amazing polynesian or caribbean feel in any setting.